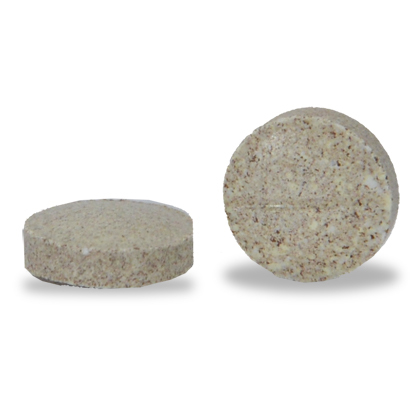 Virbantel is an over-the-counter chewable dewormer for dogs. Virbantel effectively treats and controls roundworms, hookworms, and tapeworms. 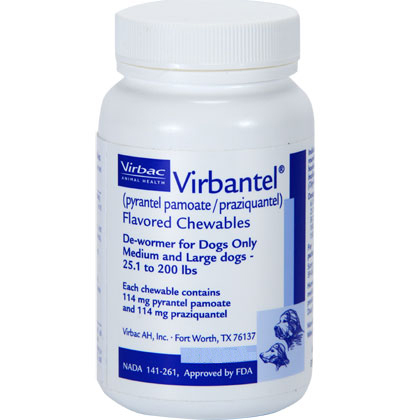 Available for puppies over 12 weeks of age, Virbantel is a flavored tablet and most pets love the taste. Please note: Virbantel is sold as a 2-pack. Virbantel contains the powerful ingredients of pyrantel pamoate and praziquantel to treat and control roundworms, hookworms and tapeworms. Virbantel is easy to administer to puppies at least 12 weeks of age, and adult dogs because it comes in a flavored, chewable tablet that most pets love. Although Virbantel is a convenient OTC remedy for worms, it is recommended that you consult your vet before administration. Consult your veterinarian for assistance in the diagnosis, treatment, and control of parasitism. Do not deworm a sick dog or puppy. Consult a veterinarian for diagnosis of the illness. Safety in breeding or pregnant dogs has not been tested. Contact your veterinarian if you notice signs of vomiting, loose stools (with or without blood), and decreased activity after treatment. Speak to your vet before administering Virbantel to your pet. Virbantel should be given as a single dose. Consult your veterinarian if you are unsure about how many tablets your pet should be receiving.